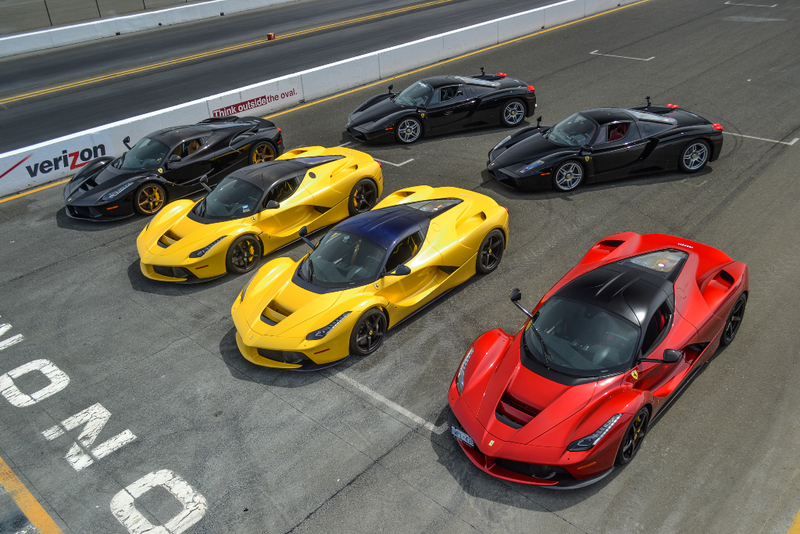 Why limit your wallpaper to one car when you can have four LaFerraris and two Enzos? Photographer Joshua Francisco took this gorgeous photo at the Ferrari Challenge Sonoma Raceway a couple weeks ago. It was really a spur-of-the-moment photo shoot setup by DitoMilian for gotbluemilk.com. I was literally running around prior to taking the photo as I was attending to a request from another associate. Emmanuel, the Marketing Manager from Ferrari of San Francisco called me on my cell phone and said “Bring your camera to the track! ...NOW!” I quickly grabbed my camera and started to walk with a purpose (actually ran). Once locating Emmanuel at the Start/Finish line, I saw him point to the flag stand where the “flag waver” displays the racing flags. I immediately climbed up the ladder leading to the flag stand with one hand, planted my foot and shot this epic photo.